Snacks and more snacks! Snacks are everywhere or so it seems when you use this Double Wide Double Sided Candy Rack. With shelves and peg hooks this snack display will let you give customers an unbelievable variety of snacks. 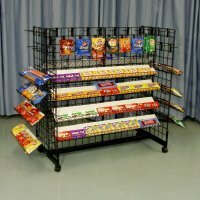 From candy bars to snacks in bags this display rack makes it a breeze to give customers the choices they crave. 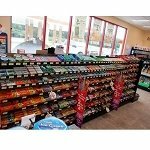 From the youngest customer to the oldest, everyone wants to find their favorite snack and this floor display makesit easier than ever. 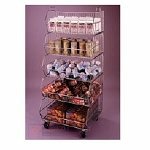 This candy rack will make the most of the space you have available while increasing those impulse buys whether in a retail or c-store. Keep this floor display near the register and well stocked and see your sales and profit margins grow. Order today at Candy Concepts Inc.